Got a tube scanner in the mail today! I paid $100 for it from Boston Piezo Optics, which seemed pretty good. If you want to get a tube from them, just make sure you get one that’s in stock as it will be much cheaper. 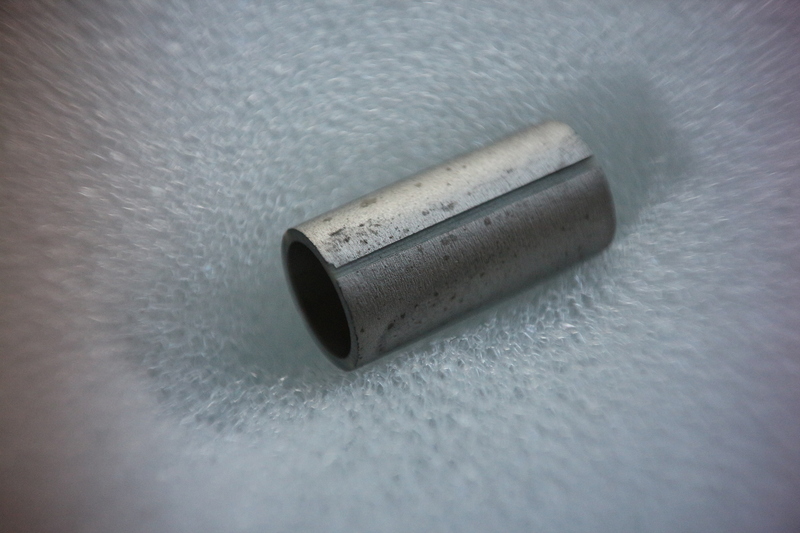 As I am more interested in high resolution than large scan ranges, I got a small, rigid tube with 0.25″ OD, 0.50″ length, and 0.025″ wall thickness. Dielectric material is PZT-5A. I’m going to design a new scan head for it, and include a stepper motor-driven coarse approach mechanism. Of course, i’ll also need to build a high-voltage amplifier to drive the tube scanner. which gives 1.7 um for my tube, so in terms of range, this tube is pretty similar to the unimorph disc, but requires much higher voltages. The big difference is in rigidity. This tube should have an extensional resonant frequency around ~30 kHz for a 1 g load , which should give a huge improvement in terms of scan speed and vibration tolerance. EBL Products has some useful information on tube scanners, including material properties and displacement formulae. Tetsuo Hanaguri has a spreadsheet to calculate scan tube resonant frequencies. None of those really look suitable for scanning unfortunately, you’d need a piezo tube or disc with quadrant electrodes, or a stage using piezo stacks. The scanner needs some way to flex or move in X, Y, and Z.
I got a question to you regarding the control of the voltages applied to the piezo that hasnt been cleared up by the link you posted above (http://www.piezodrive.com/product-tubes.html). Take for instance the peizo tube you bought at boston piezo optics which has a maximum voltage rating of 250V, where you calculated a maximum deltaX of around 1µm (125V at on electrode and -125V at the opposite electrode supposedly). If i understood it correctly, if you want to use it as a scanner, you have to supply a voltage to x,y and z simultaniously. So is the value of 250V per axis or the total voltage that can be applied to the piezo? For instance, if you would want to scan along the x-axis and start at, WLOG, +x_max, +y_max for a given z elongation, would you apply 250V to the x axis and 250V to the y-axis and ramp Vx from 250V to -250V or do you have to consider something like the rms of Vx and Vy (and Vz)? It can actually handle a bit more than 250V. That link lists the AC depoling field for PZT-5A as 7 kV/cm RMS. This is the voltage that, when applied against the piezo’s poling direction, will depole the ceramic. The wall thickness of this tube is 0.025″ (0.0635 cm), so the maximum voltage would be 7 kV/cm * 0.0635 cm = 445V. This is the maximum voltage that can be applied across the wall of the tube. Any voltage applied between the inner electrode (Z) and any outer electrode (X or Y) must not exceed 445V. This means that, if we use symmetric +- supplies, we are limited to +-222V supplies. If we apply +222V to the inner electrode and -222V to any outer electrode, then the voltage across the wall is 444V. It doesn’t matter if we apply -222V to one outer electrode or all of them, the voltage across the wall (or at least part of the wall) either way is 444V. thank you for your fast reply, it answered my question and cleared things up. I already ordered one of the exact same piezos you are going to use, since i havent found any supplier here in germany, that offers piezos at that price! Thank you for the application note. The amplifier shown there seems to be exactly what is needed here. I havent figured out yet how to generate the high voltage rails though (transform the power line`s 230V down, a dc-dc-boost converter, etc.) but i`ll definatelly stick around +-125 in the beginning. I´ll probably set up a hackaday.io project about my attempt of a STM in the upcoming weeks and hopefully i can contribute anything useful to your project, since your blog has been extremly helpful to me already (regarding planing of the device, needed parts etc..)! Cool, looking forward to seeing how it turns out! What is the difference between this tube and the piesoeletric buzzer with tip? Can you explain more to us plesae?